I don't have a very big gaming group, it's basically my wife and two of my best friends; however, on special occasions like Christmas, the family gathers around for "quality time" and I get to play some games with them as well. Now, once upon a time, those games would have been Scrabble, Trivial Pursuit, or Monopoly. I can't stand Scrabble, I loathe Trivial Pursuit, and Monopoly should not be played at Christmas (it is supposed to be the season of goodwill, after all). That being the case, I always try to roll out something different. I know I'm not going to be able to get my "non-gaming" family to play Arkham Horror or Marvel Heroes, and that's why my collection of board games also contains a bunch of "family-friendly" stuff that I normally wouldn't look twice at. 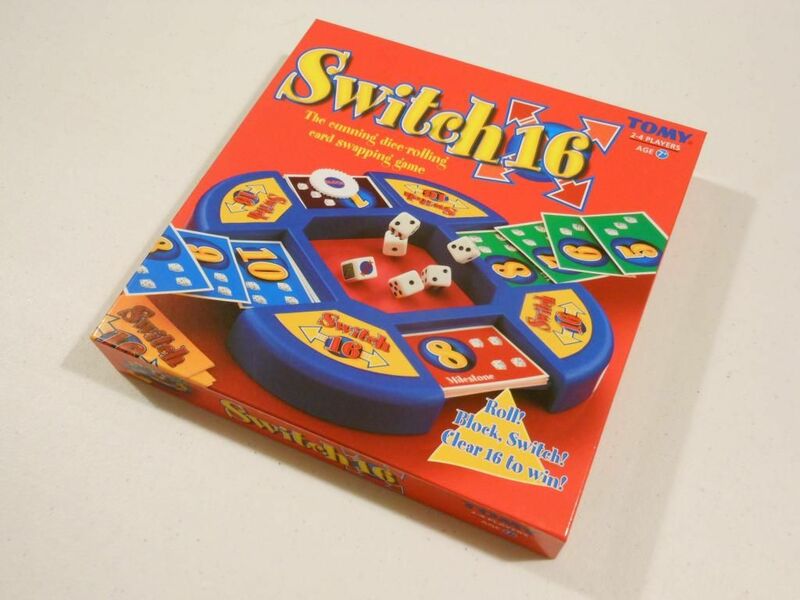 One such game is Switch 16, a game so completely and utterly random and chaotic that it makes me feel queasy to think about it for too long. This is a game that I would have been happy to wing out the window after the first game, but my parents really liked it, so I have kept it (it's still better than bloody Trivial Pursuit, after all). Now, Switch 16 really isn't my sort of game. It has no theme for a start (where are all the dragons? ), and as already mentioned, no real strategy or skill. Each player has a deck of 16 cards (numbered 1 through 16), and the aim of the game is to be the first person to discard the card numbered 16. This is achieved by rolling dice into the rather nifty dice tray. Actually, before I go on, I should spend a moment to talk about the dice tray... 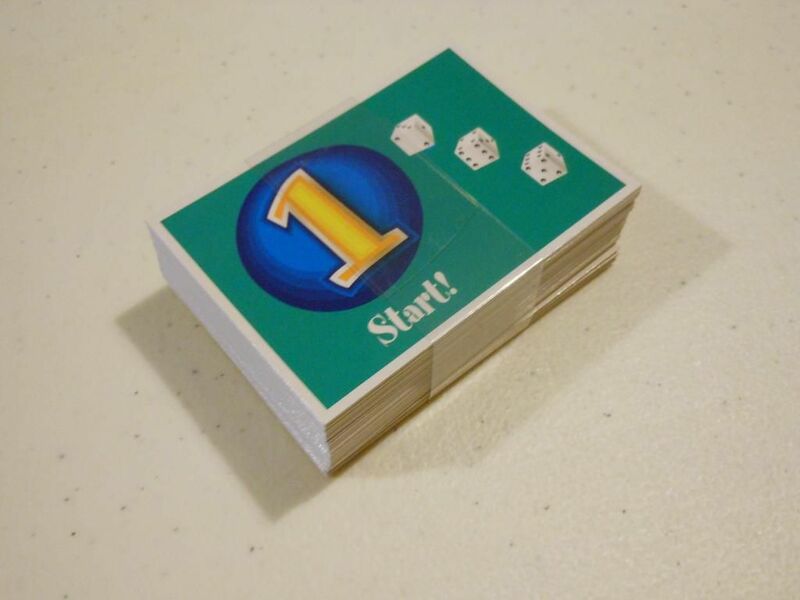 The game doesn't have a board in the usual sense, it just has a plastic tray with four indents (one on each edge) for holding the decks of cards for each player, and a central well with a foam lining into which dice are rolled. Even though the game isn't great, this tray is quite cool; and if you can find this game really cheap in a charity shop you might want to get it just so you can use the tray elsewhere. Each player puts a deck of 16 cards in the allotted space on the perimeter of the dice tray, with card one at the top and card 16 at the bottom. As well as a number, each card has a picture of some dice, and this indicates the number of dice you are allowed to roll, along with a special "switch" dice that has special instructions on it instead of numbers. For example, card one has a picture of three dice, meaning you roll three dice plus the "switch" dice. Why are you rolling dice? Quite simply, to try to match the number on the card. If any single dice matches the number on the card, or you can combine two or more dice to equal the number on the card, then you are allowed to remove that card from the top of your deck and discard it. If you are then able to use the same dice results to remove the next card you may also do that, and you can continue through your deck until you reach a number you are unable to match. On my first turn of the game I roll three dice and get 1, 2, and 4. I can match card one, so I discard it. I can also match card two, so I discard it. I can match card three by combining 1 and 2, so I discard it. I can match card four with the dice that rolled 4, so I discard it. I can discard card five by combining 1 and 4, and so on... Sounds exciting, right? Once you can't make any more combinations, you can pass, or you can take a risk. If you take the risk, you roll again; but if you can't match the card at the top of your deck after doing so, then a whole bunch of cards get returned to your deck (either taking you back to card one or card eight, depending on how far down the deck you have got). Play continues round in this fashion until someone has discarded all of their cards, or someone drinks too much eggnog and suggests playing charades instead. If you roll a green "switch" then you can swap decks with any other player (and will obviously swap with the person who has discarded the most cards). 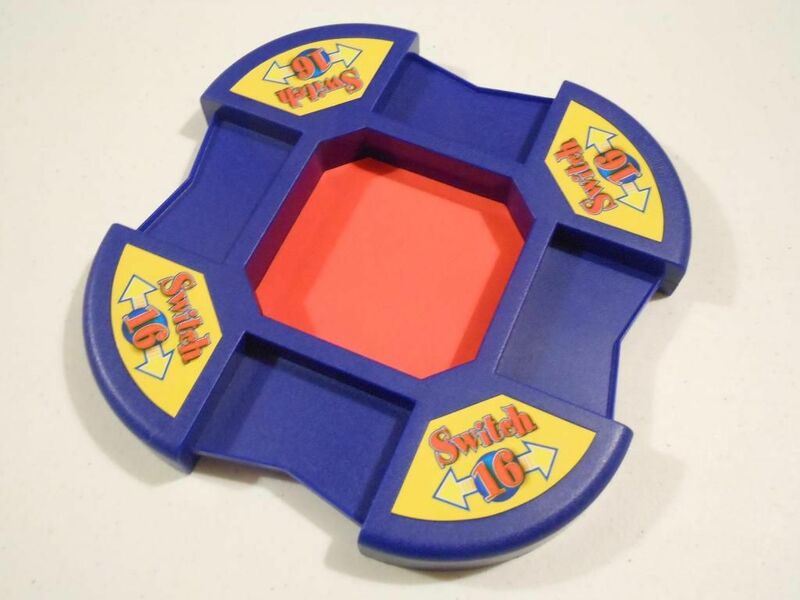 If you roll a red "switch" then you MUST swap with the person who has the most cards left to discard. Finally, if you roll "block" then you take a special "block" poker chip. This chip can be placed on any player's stack and will stop that player from discarding any more cards until he or she rolls a "block" (and therefore takes control of the "block" chip). Alternatively, the "block" chip can be used to stop another player switching decks with you. And that's all there is, folks. 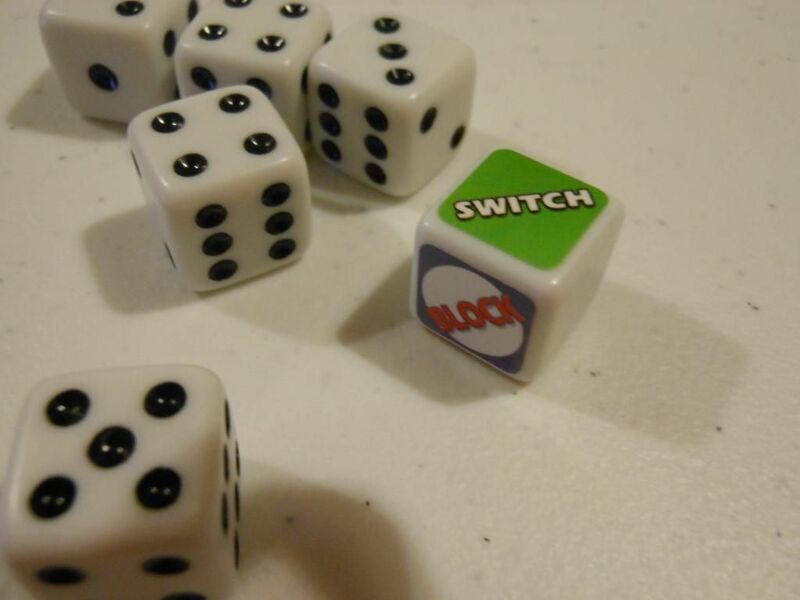 Basically, it's a dice-rolling number matching game with heaps of added luck in the form of the "switch" dice. I can't describe quite how annoying it is to be on your last card, only to watch as an opponent (who hasn't discarded any cards yet), rolls a "switch" result, meaning you have to watch totally helplessly as your deck is swapped and you are basically set back to the beginning. It's one of those games where you honestly feel like it really doesn't matter what you do. If you discard loads of cards, it doesn't matter, because invariably someone will swap with you. Similarly, you shouldn't feel bad if you haven't got rid of any cards yet, because a single dice roll can put you in a winning position by allowing you to swap with the leader. Pointless! The game rules suggest you can make "clever use" of the "block" chip; but as ownership of the chip is determined by random dice roll, there really isn't anything clever about it. There are no tactics to employ. You just roll the dice, and hope you match the numbers on your cards or get to swap with someone who is doing better than you.